Banks today require a 20% down payment when your purchase a home or multi-unit building used as personal residence. In other words, the bank wants to be sure you have 20% equity in the home before they will lend you the rest. This protects them in a couple of ways. One, if you get into trouble financially, you are going to work a lot harder to come up with your mortgage payments if you might lose the 20% invested in your home. Second, if your home drops in value after purchase, the banks have a 20% buffer before you are upside down (owe more than the house is worth), and therefore might be willing to walk away from the house, resulting in foreclosure and big losses to the bank. Premium Mortgage Insurance guarantees the bank that they will get paid if you default. This allows banks to offer mortgages with as little as 3.5% down payment. They aren't taking the risk, the insurer is on the hook. The government established the FHA in order to provide such insurance. This was to help citizens get into homes with as little as 3.5% down. Until June of 2013, this extra payment for insurance by the homeowner was limited to 5 years or until such time as the homeowner could prove that they had a 20% stake. The borrower might achieve the 20% equity through larger payments toward principle or by appreciation of the home in the market place. Unless the FHA changes their present plan, as of June 2013, the FHA version of PMI premium payments will continue for the length of the loan. The FHA is also proposing to raise their rates April 2, 2013. Private mortgage insurance is provided by independent businesses. They have thrived by undercutting the FHA rates. Generally they will only insure up to 95%, rather than the FHA 96.5%. A major difference with private insurers, however, is that they do their own appraisals, whereas FHA trusts the bank's appraisal. This can create issues in a market where prices are moving up quickly. The bank may have agreed to financing based on 95% of an appraised value of $300,000. But the private premium mortgage insurance provider might feel the home is only worth $290,000, and therefore only be willing to insure the lesser amount. A major benefit of the private plans is that they are generally only paid for two years. Choosing between FHA and private PMI providers, figuring out what to do when appraisals come in too low, and similar hiccups in the loan process are the benefits of working with a mortgage broker. The resources available to a broker are much broader and deeper than a bank loan officer. The broker wants to make the deal work. That is how he gets paid. He is constantly looking for the creative way to get past the hurdles. Tweet This: FHA Mortgage Insurance Rules to Change June 1, 2013. Move quickly to save money. 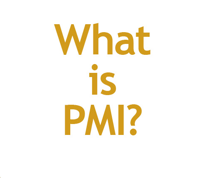 What is PMI? When is PMI the clear choice? Money in your home equity is doing no work for you. It reduces the interest you pay and that is all it does. You have lost opportunity costs associated with the otherwise dead money in equity. It feels good, but it may not be as beneficial in the long run. Getting a 95% or 96.5% loan on your home is not limited to purchases. You can use this approach to do a refinance as well. You may also want to explore Home Equity Loans or HELOC's as an alternative. However, these are generally limited to 90% of the value of your home. Was this article helpful?? If yes, it might be helpful to others. Please +1 or Like us. We do posts like this two or three times a week, so you may want to subscribe or follow us. Related Post: Should You Pay Off Your Mortgage as Quickly as Possible?